When regarding product liability, one of three potential product “defects” guides the lawyer’s case. These defects are categorized into warning defects, manufacturing defects, or design defects. The first among these, warning defects, applies to products on which a warning label fails to cover all hazards concerning the product. If a hairdryer does not warn the user about putting the product in water, any damage resulting from the use of a hairdryer in water creates product liability in the form of a warning defect. A manufacturing defect occurs when the product is damaged or flawed during the creation process but is placed on a store shelf. These products, such as a chain with a broken link or a failure to watch the adhesion process in the creation of car tires, could cause anything from dissatisfaction to severe injury and as a result create the potential for product liability in the form of a manufacturing defect. The final defect, a design defect, occurs when a product in and of itself is deemed inappropriate or dangerous. If an action figure has small parts resulting in a choking hazard, but is labeled for toddlers (2+ years), the product may not have any physical damage, but can result in serious injury because it was not designed for the age-group. The idea behind the product is considered damaging and could result in the recall of said product. If a product is considered inappropriate or dangerous, product liability in the form of design defect could be a potential avenue for legal action. If you have been harmed by a product, you may have a case worth investigating. There are numerous checks to ensure the injury was indeed a result of a defect versus inappropriate use and a lawyer can help to determine if you have a legitimate claim. If you would like to talk with the lawyers at Blake Scoggins Law, we can help you with your case. Visit our website at Blake Scoggins Law or call us at 770-877-2258. A good friend of our firm is in the midst of teaching his third daughter how to drive. Just the other day, it was time to take her onto the interstate and get her some experience dealing with the higher travel speeds and how to navigate lane changes. At one point, they found themselves boxed in on three sides with tractor trailers and only the right shoulder open. At one moment, the truck traveling in the middle lane began to drift into their lane and they had to move to the edge of the shoulder before the trucker corrected. Needless to say, a young, inexperienced teen driver found her heart slamming into her chest, thinking they just avoided getting side-swiped by a big rig! In this case, nothing happened, but it shows how quickly a normal day can turn to tragedy. If you or a family member has been victim to a trucking accident, Blake Scoggins, LLC will come to your aid. This is a very serious type of claim that usually involves serious injuries and sometimes even death. A claim of this magnitude, although similar to an everyday car accident, can be much more difficult and complex. Most trucking companies carry commercial insurance as opposed to your typical car insurance. However, as with most insurance companies, they will try to give you as little compensation as possible, especially a case with serious injuries from a negligent truck driver. Most trucking companies will almost immediately send their investigators to the accident scene. You will need to have your own expert investigators on the scene as soon as feasibly possible in order to show what happened from your point of view and to deter any form of bias that may harm your claim. We can help you with getting an expert to the scene and help build your claim. Failure to maintain the tractor and/or trailer in proper working order, failure to maintain lane, texting while driving, drinking while driving, exceeding regulated driving hours, and blowouts are just some of the factors that could lead to one of these devastating accidents. Do not let these negligent factors keep you or your family from getting the compensation that you deserve. Call us today at 770-877-2258 or use our Contact Us form on our website. When we hear someone arrested for assault and battery, it conjures up the worst images in our minds of bruised eyes and busted lips. In many cases, those thoughts are warranted. But, do you know the difference between 1st degree charges v. 3rd degree? What about being charged under the Family Violence Act? Think about this: Every couple argues at some point. Disagreements can become heated and tempers can flare and voices rise. But, if your spouse tries to push past you and/or you try to hold them to keep them from running away, and there happens to be a child under the age 18 in the vicinity, you very well may be charged with assault and battery under the FVA. In legal terms, a person commits the offense of simple assault when he or she attempts to commit a violent injury to the person of another; or commits an act which, places another in reasonable apprehension of immediately receiving a violent injury. In Georgia, Battery is different than Simple Battery. Battery is when a person intentionally causes substantial physical harm or visible harm to another. Visible harm is bodily harm capable of being perceived by a person other than the victim and may include things such as, black eyes, swollen lips, bruises, etc. On the other hand, Simple Battery is when a person intentionally makes physical contact of an insulting or provoking nature with the person of another; or intentionally causes physical harm to another. More often than not, responding officers will have no choice but to charge the party who touched another during an argument, even if there were no visible injuries. The simple act of pushing someone out of the way or grabbing someone’s shoulders to keep them from lashing out will likely land you in jail with charges levied. If you have been charged with Simple Battery, or feel that you have been wrongfully accused of the aforementioned crime, then call Blake Scoggins Attorneys at Law to help you with your defense. Depending on the situation and how the events took place, we will be able to evaluate your claim and tell you where you stand and what type of defenses you may have. Blake Scoggins, Attorneys at Law LLC is a law firm that strives to protect the interest and rights of each and every person that walks through our doors. We believe in taking the time to meet with our clients personally. This helps to develop a genuine attorney/client relationship, geared toward getting the best possible outcome for the client. Obviously, there are no guarantees in the legal system. We cannot guarantee that you will win your claim or be successful in your suit, but what we can guarantee is that our experience will give you a realistic approach to your specific situation. We will be honest in our evaluation of the claim and discuss the possible avenues you may choose to take. Call us at (770) 877-2258 to set up a free consultation so that we may properly evaluate your case. This is a true story. The names have been removed to protect the innocent. A client of ours came to us after having been in a car accident. The other party had pulled out in front of him and our client had no way of stopping in time. His car was totaled and he required medical attention, necessitating an ambulance to take him to the hospital. Here was a perfect example of two different claims happening simultaneously — property damage and personal injury. As is typical, after the smoke cleared and the investigations completed, the offending party’s insurance company quickly drafted a document and cut a check to compensate our client for the vehicle. The offer was a joke. Our client didn’t know that. He believed the other person’s insurance company was heroic for getting him a check in such a short amount of time. But, because we were involved from the onset, we were able to not only reject the offer, but also able to negotiate with their high-priced attorneys (attorneys whose job it is to protect the profitability of the insurance company) and get a new offer nearly 10 times larger than the first. In a perfect world, any citizen should have been able to negotiate a fair and reasonable payout to compensate for their totaled vehicle. However, in our current climate, you need the skills a qualified attorney brings to the table. In this same situation, by negotiating a much larger and equitable settlement for the property loss, we have established a relationship, putting the insurance company on notice that we expect the offer to compensate our client’s personal injuries to be much more in-line with what is fair and reasonable. Contrary to Hollywood, personal injury lawyers are not looking for windfall lawsuits meant to bankrupt insurance companies. Personal injury attorneys work hard to get fair settlements to adequately cover the medical bills, pain and suffering incurred by our clients. We simply want to make sure the rights of the injured are not “bought off” by someone trying to protect the profits of their employer. 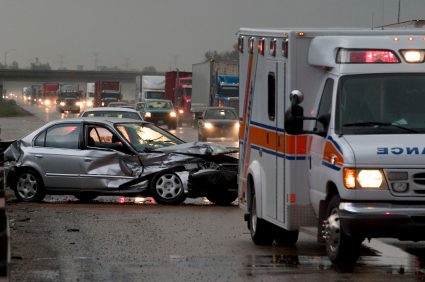 If you’re involved in a car accident, you may be entitled to a recovery for your damages. Property damage is usually settled fairly quickly between you and the insurance company. The personal injury is usually not as quick. If you are injured and received medical treatment, then medical records will need to be requested by all of your medical providers in order to properly evaluate your claim. As demonstrated above, seeking an experienced lawyer will improve your standing with the insurance company. Call the attorneys at Blake Scoggins, LLC today to see what they can do for you and your claim. Don’t let the insurance company compel you to act alone. We can help you today.